This insert is dated Aug. 2011, I encourage anyone with Faeto roots to head over to Faeto.blogspot.com. So I have blogged about my Croatian/Bosnian adventure and the maternal side of the family history, now for my paternal heritage. The last part of the great European adventure was spent in Faeto, Italy. Faeto is a small town in the Puglia region about an hour from Foggia, unless of course I am navigating the terribly marked roads, then it could take closer to 2 hours. Faeto clings to a rocky hillside, probably looking very much as it did when my grandfather left there at the age of 14. This was my second trip there, and it was as moving as the first. But the first must be revisited to bring perspective. In 2003, my entire family, 23 of us went to Italy. We were celebrating my parent's 50th Anniversary and saw Italy in our own bus. We hit the highlights, David, the Leaning Tower, Ponte Vecchio, the Coliseum, the Vatican and Amalfi. But hands down the highlight was the culmination of the treacherous drive on the narrow roads to Faeto. The last few miles are canopied by trees that were in blazing color. The bus parked at the edge of town, and our new internet friends met us for the day, we had 3 guides to help us with the language. Faeto has a heavy French dialect and the Italian there is different than any other region. We began at the small farmer's market where this cute old man walked up to me and and said "Who are you?" And I said, "We are Petittis." He smiled and said "So am I". And that's how it was. We were quite a sight as our mob walked the small cobblestone streets my grandparents walked. We made offerings in the church where they were baptized and walked Vico Valentino, the oldest street, dating to the 15th century and named for the women of my family, sisters or cousins Rose and Maria Valentino who married the Petitti men. Six years later we took the same walk on a similar fall day. The air was heavy with the smell of fires in the small homes, and the cemetery was filled with Petittis, certainly we all share the same blood. The cemeteries are peculiar here, perhaps because of the rocky terrain or the wet winters, but they do not bury the dead. They have large walls like a mausoleum and a headstone, wired with electricity so they have a light on all the time. The addition of a photo is also very common, and a little eerie for sure, but a rarity in the U.S., although my great-grandfathers grave in Chicago bears his photo. Sitting alone in the cemetery on a small rock wall, was an old lady, wearing black and saying her rosary. The whole town has been burying their dead in this small cemetery, it is a moving place. We have very little information on the lineage of the family. My great grandfather came here as a young man and was murdered in Cleveland, OH. My grandfather was just 14 when he made the trip from Naples, just a year after his father died. They were so willing to walk into the great unknown for a better life. My own dad says that there was very little information about Faeto from his parents. Like many immigrants, you were careful to only speak English and absorb the new culture. No one wanted to be labeled an immigrant, they wanted to be Americans. My grandfather served in WWI to become a citizen. The history of the Italian heritage was literally lost over the years. But there is something oddly familiar and comforting in Faeto. Maybe because it is so small and after two trips I know the town like the back of my hand. Maybe it is because although my grandfather came to America, he left many family members in Faeto, and the names in the cemetary and the faces in the windows are my cousins, many years removed. On this trip my parents, my sister Lori and I arrived in Faeto at dusk and found our hotel in the small park in the woods outside of Faeto. The lights were aglow and we entered the modern building and found no one there. We laugh to think that this could never happen in the U.S. There on the counter was a note (in Italian of course) and 2 room keys, skeleton keys, no less. We brought in our luggage and hunted for the bar for a little wine to take the chill off. Our host arrived shortly thereafter and spoke NO English. 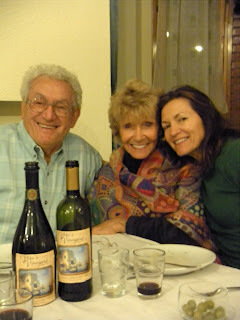 Our old friend from the last trip, Pepino, came to have dinner with us at the hotel in the woods and we celebrated my dad's 80th birthday that night. Imagine, celebrating your birthday in the town where your own father lived 100 years ago? It was a poignant evening. The food was rustic and home made and delicious. I love a 3 hour meal, what a wonderful way to live! We spent a few days exploring the area, eating the wonderful comfort food of Italy, and meeting the locals. One afternoon we walked into the bakery. We had been eating this wonderful bread everywhere in the area, and the small bakery where they bake it was warm and inviting. We sampled the day's offerings, my favorite being the bread stuffed with sweet cipollini onions. The funny thing was Anna the bakery owner was sitting with her laptop surfing facebook! I gave her my card and she friend requested Lori and I. Too bad my Italian is pitiful and we can't really chat, I am very dependent on Google translator. She especially loved the photos I posted of her, her family the bakery and some of the colorful locals. It was a short visit to Faeto, but we have accepted the fact that indeed, this is where we come from. Many of the little details are faded and lost, and that's okay. We embrace what is left, we hope the grand children and their children will someday drive under those canopied trees and walk Vico Valentino, pray for the Petittis buried in the quaint cemetery and feel the same connection to generations of family. I am taking a quick break from the Great European Adventure blogs so I can fulfill my Daring Baker's Challenge. Let me begin by warning any would be macaroon bakers, this is a terrible recipe to attempt in Memphis during the "rainy season" which apparently is right now. I mean unending rain, it is miserable. Macaroons are supposed to be light and airy with an ethereal crunch to them. That is hard to achieve when the relative humidity hovers at 99.9%. I am going to crank up the heat in my house and see if I can dry out the air a bit. We were given free reign as far as flavoring the macaroons and filling them with whatever we cared to. I love almond and chocolate. So I opted for a little Halloween combo cookie. I used a little orange powdered food coloring in the cookie batter and sandwiched them with chocolate buttercream. Delicious and perfect for Halloween week. It is crucial that your ingredients be at room temperature, and eggs whip up beautifully in a copper bowl if you happen to have one. Be watchful, over-beaten egg whites will lead to disaster. I upped the time on the first bake designed to dry them out a little from 5 to 8 minutes due to the humidity. The original recipe is supposed to make 10 dozen, the first tester's yield was 2 dozen filled, which is close to my yield, but I did try to make them a little on the small side. I baked them for a full 10 minutes, and after cooling on a rack, I put them back into the oven (turned off) to dry the bottoms a little. Normally these would rise into fluffy little pillows, but this is the result in high humidity. The taste is still great. Macaroons are the rage in bakeries everywhere, so with just a few ingredients and a little patience you can recreate them right in your home. Fabulous! Dear Readers, I have taken a small break from the food blogs to blog about my European trip. It is really for the benefit of my family, a sort of diary of the experience. I will get to the great food, I promise, there is much to talk about! Have you ever asked someone where they are from? I usually answer Iowa. I grew up there, went to high school there, eventually transferred back to college there and got married. But in the last 45 years, I have lived a lot of places and just this year I discovered where I really come from. No discredit to Iowa, but would I be that different if I was raised in the same family but lived in New Mexico? I think not. I believe where I come from is relative to where my family comes from. I went and saw the roads and alleyways my great grandparents and grandparents walked. 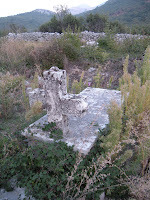 I drank water from the village spring and walked around the ancient cemeteries. I heard the languages they spoke, ate the food they knew and gazed at the landscapes they called home. My mom's family came from Yugoslavia. I know, it really doesn't exist anymore, but it's what I have always known. Her Grandfather, Steve Miskin was a Serbian from Trebinje, which is now in Bosnia. Confused? Yea, me too. But I went to Trebinje with my Mom and Dad to see where Steve Miskin was born and raised and where he would have probably died and been buried if he didn't dream of a better life. Trebinje is a charming town just 18 miles over the mountains from Dubrovnik and the Adriatic Sea. There is no love loss between the Croatians in Dubrovnik and the Bosnians in Trebinje. The "last" war as it is often referred to there was deadly and ugly and the scars are still present. We went with another couple my parents met in Florida with the surname Miskin. Richard did a lot of research on his family, and prior to the mid 1700's the trail runs cold in England. He was fairly convinced that his family originated in Yugoslavia, so he and his wife Becky came on the Bosnian journey. Steve Miskin although many years passed on has a great-nephew in Bosnia, Savo and his wife Jadranka, daughter Mirjana, and son Vladomir (Vlado). None of them speak English. Thankfully, there was another Miskin (by marriage) Miljana who translated the entire day for us. Our Croatian driver dropped us off at the Platani Hotel in Trebinje and we met up with Miljana and had coffee. My favorite European experience is sitting outside on a beautiful day sipping coffee. What a great idea, no paper cups and hot sleeves for you to mindlessly drink as you drive around. Sitting and visiting, sipping incredibly strong coffee and perhaps smoking if you live in Bosnia. Apparently they don't have a surgeon general to tell them how bad it is for them. We enjoyed sitting outside in the large square canopied by the Platani trees, which are like our Sycamore trees. When the rest of the family arrived we sat down to lunch inside the hotel. Of course it began with wine, then Bosnian Antipasti, fresh bread, and platters of meats. Sausages, veal, pork chops and chicken accompanied by a platter of salads, lettuces, tomatoes, cucumbers and slaw like my Grandma made, cabbage, vinegar and oil, no mayo here. It was delicious. For dessert I ordered Baklava, which the Croatians were quick to tell me was a Muslim dessert. I always assumed it was Greek, we make a Serbian version called pita or burek, and whatever its origins, it was delicious! Now the real fun would begin! We left the hotel on foot and across a large park where a farmer's market had been in the morning. The litter was unbelievable. There were trucks out cleaning up, but I know the Santa Monica Farmer's Market or Memphis Market doesn't look like that when it's over. But litter is very common all over Europe, very tragic. Miljana took us to her school where she teaches English. It was very inspiring and unfortunately the cost to send her books is high or I would empty my shelves of the kid's easy readers and send them on, as they are hungry to learn the language. Most of the signs in Bosnia are written in Cyrillic which is virtually impossible to decipher. I felt like an alien the entire day. We proceeded to the cars and I rode with Vlado and my parents. Typical post teenage boy, drives too fast with the music too loud (see previous post for video). Our first stop was the monastery on top of the large hill in Trbinje. It has a new Orthodox church and a view that is spectacular (see the view at the beginning of this post). My great grandfather was Serbian Orthodox, as was my grandmother, but in DeKalb, IL there was not an Orthodox church and my Grandmother converted to Catholicism when she married. The church interior is gorgeous and the icons are very similar in every Orthodox church. There are many of St. Michael the Archangel (a personal favorite) and St. Stephen which is the patron of my family. I lit a candle for my own family thousands of miles away. We then went to Savo's store. It is a feed and construction type business and the small store has drinks, eggs ( not refrigerated) and food. We had a cold drink mingled with the locals and moved on. Vlado drove us to the family village along one lane roads in the thick brush of the country. A hundred years ago, many families established their own "village", basically a cluster of homes with gardens, root cellars, vineyards, bee hives and crops. They could self sustain for the most part. Of course, those days are over, and our village has been bombed by missiles and is decaying. There is still an old gentleman living in the only standing structure with his lush garden and grapes rotting on the vine. It is amazing to think Steve Miskin was born and raised there, and that 20 years ago my mom visited relatives inside that home that the war destroyed. The cemetery was down the road and was overgrown with 4 foot weeds, but the newer graves were covered with flowers and next to them were crosses that were hundreds of years old. We left this family village and Miljana took us to her village. Her husband was a Miskin and was very active in preserving the history of the family. He restored a small chapel in the cemetery where he was eventually buried and it is a tribute to him. Miljana's village had an ominous warning tacked to a tree, a reminder of that war again, there are potentially land mines anywhere that hasn't been thoroughly swept. She lives in her country house on weekends and holidays from school. She also has a small house for her daughter in college, Anna and another small building is a replica of a home from the 1800's where she is putting in antiques to make it a museum. How nice to have this small compact neighborhood, but you had better like your only 4 neighbors! By this time it is late and dark and we call our Croatian driver to meet us at the border. No one really wants to drive into the other's country after dark. Interesting dynamics. It was a great day. I learned so much about about the hardships and the drive it had to have taken to get on a boat and come to the U.S., leaving the comfortable surroundings your family had lived in for hundreds of years. I am grateful he came, but I am also grateful to know where I came from. Next, my dad's family story. I was lucky to have a 12 day vacation in 3 countries, and I have so much to get off my chest about it all. From food, to driving to the charming towns, crazy happenings and the hunt for the family lineage. This blog is dedicated to the greatest feat in Italy since the Coliseum: the Autostrada. It has different names in different countries (we all know the Autobahn in Germany) but the concept is so smart. But let's start the journey before we even get the rental car in Italy. We first went to Croatia and Bosnia and had the privilege in Bosnia of riding with a teenage boy. We arrived in Dubrovnik and we were located one block from the walled city, so transportation was not an issue while in Croatia. However, we had a one day adventure planned to Trebinje, Bosnia to visit some relatives. I had no idea that there was such tension between these two countries still, and the fact that we were going to Bosnia to visit relatives was not looked upon favorably. There is basically only a small mountain range between Croatia and Bosnia and we hired a driver to take us the 18 short miles into Bosnia. Lucca the driver was 8 when the "last" war broke out. He told us about no power and limited food and bombings from the top of the mountains. His dad was off fighting for months with no contact. Can any of us imagine that? Thankfully both countries have rebuilt and the scars of the war are hard to find. He dropped us off and left. He met us at the border after dark. Sounds very clandestine doesn't it? Trebinje, Bosnia is a small city, and like most European towns the streets are narrow and packed with cars. We met the relatives at a hotel for coffee and lunch and then went in their cars to see the old cemetery and homestead. My parents and I rode with Vladomir, my second cousin (? ), 21 years old, and doesn't speak a lick of English. Thankfully the stereo in his car works perfectly and he blasted the Bosnian music as we screamed down one lane roads (at least until another car comes) to see the sights. Hard to believe it was as uneventful as it was. Driving to the border in the dark was the real highlight. A few days later we flew to Venice, Italy and went to Hertz to begin the real driving adventure. The car was a European Ford model, like a mini station wagon, Lori was the driver with her International Driver's License, (for $30 you can get one too, no test involved), I was the navigator. We got our maps, the map quests we printed off at home and left the airport. I pride myself on my navigation skills, however they failed miserably that night. I navigate by direction, and in the dark, a compass would not have been a big help, because you drive in circles, no one there cares what direction is North. The signs are a little tough to follow sometimes because they are essentially names of town on an arrow, and you must know what town lays 20k or 40k down the road, and exiting through a round-a-bout can be a heart stopping event for a newbie! It took us 1 1/2 hours to get to the hotel which was about 2 miles from the airport, but we had our first Autostrada experience which would come in very handy as the week went on. The Autostrada is essentially an Interstate, but with very clear rules, which no one really follows. They are generally 3 lanes, large trucks to the right, small trucks and cars in the middle and cars only in the left. What a great idea, you rarely find yourself stuck behind or between semis, but the truck traffic is staggering and they tend to block the signs posted on the right. Also the speed limit is higher for the car lane, although it is posted so infrequently we were never sure what it was, "keep up" was our motto! We were very fortunate to be traveling in the off season, as the traffic jams reported on the Autostrada are nightmares. You enter the Autostrada and take a ticket and then wait for an opportunity to jump in (jump in the truck lane no less). There are few exits on the road, and you have to know what large cities are near your destination. When you go to smaller towns, you sometimes exit many miles before and take smaller roads to your destination. It's an interesting system, reduces the merge factor significantly. The private highway system is also home to the Autogrill, basically the only food option on the road. We had to partake, and were amazed at the number of people. You have a bar, which is where you get your coffee. No paper cups with hot sleeves here. A shot of espresso in porcelain, down it at the counter and get out of the way! Then the Snack section, various sandwiches, pizza even french fries. I was impressed that even though they eat standing up, no one eats with their hands. Apparently hands are only for talking! They keep the sandwiches wrapped where they hold it, and eat pizza with a fork and knife. They serve beer, bottle and on tap...scary. And there is also a sit down restaurant where everything is made to order and you can have a real Italian meal with Anitpasti, Primi, Secondi and Contorno, and Dolce and Espresso. Then there is the store section which you have to pass through to exit the building. Similar to ours they offer an abundance of snacks, condoms, chocolate, drinks (even the hard stuff) and toys. It is a self enclosed highway system, so no other food or gas options unless you exit. If you get off, you pay your fare, a few Euros to 20 Euros and up depending on how far you have traveled. The pay off is clean roads, well maintained, well lit tunnels and pretty good signs. We took the Autostrada from Venice to Lake Como and then southeast to Foggia. We were never in a traffic jam and the experience was great! As we drove South on the Autostrada past Pesaro, we were awed with the landscape. To our left the Adriatic Sea in all its majesty, to our right the snow capped mountains of the Apennines southern edge. The road winds and goes in and out of tunnels and is flanked in the Puglia region by lush groves of olives and grapes that cling to the rolling hillsides. As soon as you exit the Autostrada and its self funding toll system, you see how bad things really are. The secondary roads are not maintained well and have inadequate signage. My favorite sign was a white triangle outlined in red with a huge exclamation point. Pretty self explanatory. When we reached our destination in Puglia, the small home town of my grandparents, we were twice met on the small 2 lane roads with washout. Amazing how one lane of the road just seemed to slip away down the embankment. Not sure how well that plastic tape would hold back an auto coming around that curve! We survived the great driving adventure. 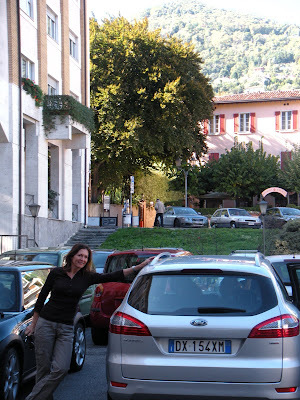 We found parking, with big kudos to Lori for her most impressive manual transmission parallel parking, we had no fender benders, we were lost only once (it was a biggie however), and we saw 1500km of Italian countryside. Just wonderful. Next we explore the delicious food that awaited us. So the last home volleyball game was tonight for the season, and the last home game for the seniors. We always do a little something to honor them, flowers, speeches, cake balloons. I got an idea from some picture surfing on Facebook, and made the whole team plus coaches and manager out of sugar cookies. I ordered a cake smooth iced and decorated it like a volleyball court, then I plopped all the sugar cookie players on the court. I think it was pretty darn cute.